The essays assembled here represent forty years of reflection about the European cultural past by an eminent historian. The volume concentrates on the Renaissance and Reformation, while providing a lens through which to view problems of perennial interest. 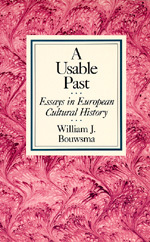 A Usable Past is a book of unusual scope, touching on such topics as political thought and historiography, metaphysical and practical conceptions of order, the relevance of Renaissance humanism to Protestant thought, the secularization of European culture, the contributions of particular professional groups to European civilization, and the teaching of history. The essays in A Usable Past are unified by a set of common concerns. William Bouwsma has always resisted the pretensions to science that have shaped much recent historical scholarship and made the work of historians increasingly specialized and inaccessible to lay readers. Following Friedrich Nietzsche, he argues that since history is a kind of public utility, historical research should contribute to the self-understanding of society. William J. Bouwsma (1924-2004) was Sather Professor of History at the University of California, Berkeley. His books include Venice and the Defense of Republican Liberty: Renaissance Values in the Age of the Counter Reformation (California, 1968) and John Calvin: A Sixteenth-Century Portrait (1988).